Succumbs to turgidity. And...intentionally or not...conveys the impression that the film uncritically celebrates the Confederacy. 280 min. Warner Brothers. Directors: Ron Maxwell, Ronald F. Maxwell. Cast: Jeff Daniels, Stephen Lang, Robert Duvall, Mira Sorvino, C. Thomas Howell. The first thing one notices when opening up Warner Brothers' new Blu-ray Digibook release of Gods and Generals: Extended Director's Cut is its defensiveness. The Gettysburg Digibook includes a one-page note by writer-director Ronald F. Maxwell. The Gods and Generals Digibook begins with a nine-page essay by Maxwell, in which he takes shots at the politicians and critics who have questioned his film and identifies a similar "prejudice" in "the Academy." So don't expect to see Maxwell up at the podium any time soon. Adapted by Maxwell from Jeff Shaara's historical novel of the same name, Gods and Generals was critically excoriated upon its theatrical release in 2002, and its reputation won't improve with the additional hour of footage found in the Extended Director's Cut (which runs about four hours and forty minutes). The film has its selling points, the same ones that distinguished 1993's Gettysburg: detailed Civil War reenactments and some potent acting, most notably here from Jeff Daniels (reprising his Gettysburg role of Colonel Joshua Lawrence Chamberlain) and Stephen Lang (another Gettysburg vet, but in the new role of General Thomas Jonathan "Stonewall" Jackson). But the arguable deficiences of Gettysburg (namely corniness and bloat) wind up amplified in Gods and Generals, which has the added problem of a dissipated focus and resulting lack of narrative cohesiveness. Bankroller Ted Turner reprises his role as Colonel Waller T. Patton, who sits beaming over the shoulder of Robert Duvall's Robert E. Lee during a Union-bashing vaudeville. All but gone are the weaknesses of character, in men of both sides, acknowledged in Gettysburg: everyone is thoroughly stolid, upstanding and noble—at worst, maybe a touch idiosyncratic. Even John Wilkes Booth (Chris Conner), in a restored but pointless subplot that definitely should have remained on the cutting room floor, seems like just another man of conviction, with perhaps slightly wider eyes (and heaven spare us the awkward attempts to borrow import from Shakespeare). With his museum-ready portraiture of Lee and Jackson, Maxwell sees no irony in the historic Chancellorsville account "It must have been from such a scene that men in ancient times rose to the dignity of gods"—instead his film resembles the remark. 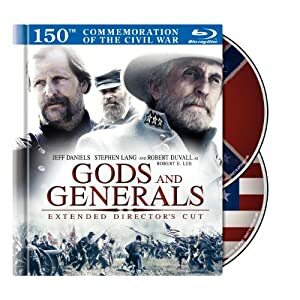 Warner's Blu-ray Digibook release of Gods and Generals comes with a handsome, full-color 48-page booklet including cast and crew bios, timelines and a weaponry glossary. It also showcases A/V quality much sharper than that of Gettysburg: the image particularly shines in the areas of detail and color. 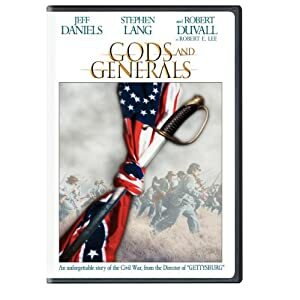 Though hardly noticeable, a few compression issues suggest this mammoth film has tested the limits of a single Blu-ray disc, and there are scattered digital artifacts, but on the whole, Gods and Generals retains its film-like character while also conveying a crisp appearance. And the lossless DTS-HD Master Audio 5.1 surround mix represents a big leap up in audio quality even from the film's previous Blu-ray release (and certainly over the relatively restrained impact of Gettysburg). The Blu-ray disc includes an “Introduction by Ted Turner & Director-Screenwriter Ronald F. Maxwell” (9:44, HD); a 2004 commentary by writer/director Ronald F. Maxwell, historical consultant Keith Gibson and professor James Robertson (1:29:00, HD); and Extended-Cut commentary by Maxwell, Gibson and Robertson (4:39:55, HD). While billed as new, the latter incorporates the 2004 commentary and adds new passages for the fresh footage, so one can listen to the new commentary and entirely skip the old one. The set's second disc, a DVD, kicks off with “The Life of Thomas ‘Stonewall’ Jackson” (14:31, SD), an interesting featurette with historical imagery and interview clips of Gods and Generals author Jeff Shaara, VMI Museum director Colonel Keith Gibson, James I. Robertson, Jr. of Virginia Tech, and Stonewall Jackson House executive director Michael Anne Lynn. “The Authenticities of the Film” (12:56, SD) focuses on production design and historical detail, and includes comments from Maxwell, producer Ronald G. Smith, producer Dennis Frye, production designer Michael Z. Hanan, stunt co-ordinator Chris Howell, cinematographer Kees Van Oostrum, military advisor Dana Heim, costume designer Richard LaMotte, and Jeff Daniels. “Gods & Generals: A Journey to the Past” (22:02, SD) is a blatantly promotional cable doc with behind-the-scenes footage and interviews with Donzaleigh Abernathy, Frankie Faison, Daniels, Robert Duvall, Maxwell, Stephen Lang, Turner, executive producer Robert Katz, Kali Rocha, Mira Sorvino, Kevin Conway, and Hanan. Rounding out the disc are “’Cross the Green Mountain’ - Music Video by Bob Dylan” (3:16, SD), “Ron Maxwell’s Invitation to Take the Journey through Hallowed Ground” (7:01, SD), and the film's “Theatrical Trailer” (1:43, SD). All site content © 2000-2019 Peter Canavese. Page generated at 04/21/2019 05:21:36AM.